IPS parent Adrien Meyer (left) serves as auctioneer for the Annual Benefit. In the past, The International Preschools held two separate events, one during the holiday season and another in the spring. The FAN (Faculty Appreciation Night) took place in early December and was established to commemorate the incredible teachers, administration, and staff members who make up the IPS family. IPS milestone recipients (staff members celebrating 5, 10, 15, 20 years and beyond) were specially recognized at this fete. 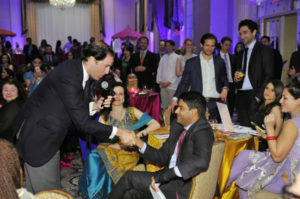 The Spring Benefit was held in April as both a festive community event and as a fundraiser for our school. Silent and live auctions, which included family vacations to exciting destinations, helped bring in revenue and support for IPS. An online auction, which promotes a variety of items including the wildly popular IPS teacher play dates, runs for two weeks prior to the benefit. 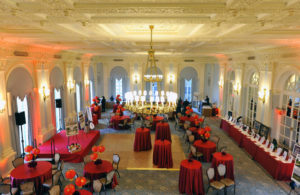 In recent years, the FAN and the Spring Benefit were merged to create the Annual Benefit; this year, the Annual Benefit, which had previously been held in the spring, was given a winter date. 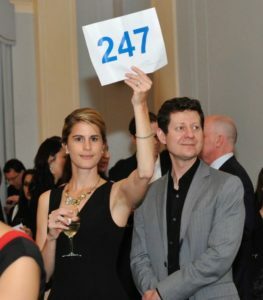 A parent bids at the Annual Benefit’s live auction. At this year’s benefit, French food and drink will be sampled and served in honor of the theme. Parents and teachers are invited to dress in clothing traditional to France if they so desire…otherwise, festive, business, and/or cocktail attire is worn by the guests. DJ Hesta Prynn, a parent at our 45th Street location, will once again provide music for the event, and Adrien Meyer, a three-time parent at our 76th Street location, will lead our live auction Our milestone teachers and staff will be honored at the event as well. Look out for next week’s blog post, which will highlight the IPS 2018-19 milestone recipients! To learn more about the Annual Benefit at The International Preschools, click here. Not a member of the IPS community, but want to be? Learn more about the admissions process by clicking here.